Maruzen pioneered the adoption of all-stainless steel specifications for all of its tanks. 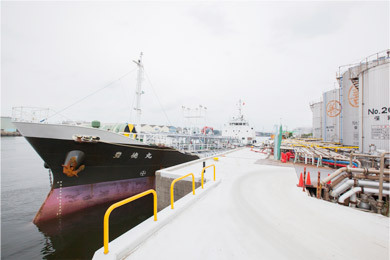 The Maruzen Group’s Keiyo Oil Terminal is situated next to Tokyo Bay in Ichikawa City, Chiba Prefecture, and is used as a public logistical base for chemicals that allows us to effectively serve the Kanto region; which consists of the Keiyo area in Ichihara, Kawasaki; the Keihin area in Yokohama, Saitama, Tochigi, Gunma; and the Kashima area in Ibaraki. We strive to ensure total quality control and the satisfaction of safety standards in our all-stainless steel one-tank/one-line tank yards. 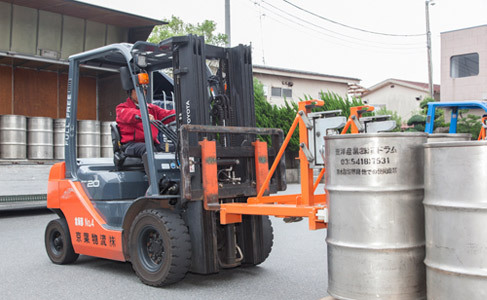 By taking advantage of excellent locations and our many years of experience, we facilitate the deployment of agile logistics both within Japan and abroad. Chemicals are stored in our automated multi-tier warehouse for hazardous materials and two of our warehouses for ordinary materials. An environment that can be used by clients with peace of mind is made possible in part by computer-controlled inventory management. Two of our warehouses for hazardous materials are capable of accommodating large amounts of designated combustibles and general goods. These warehouses broadly meet the needs of clients as logistical sites serving the northern Kanto region and as relay locations for the selection of sites. 2016: The Kashiwa Complex is launched in order to meet the needs of our clients. 2015: In recognition of our cooperative stance towards the Ministry of Land, Infrastructure and Transport, we are conferred the Minister of Land, Infrastructure and Transport’s award for distinguished service rendered for maritime affairs on Marine Day by Minister Ota. 2012: In recognition of our stance on the handling of hazardous materials, the company is conferred an award for operating a complex in excellent standing in the Kanto-Koshin’etsu area.